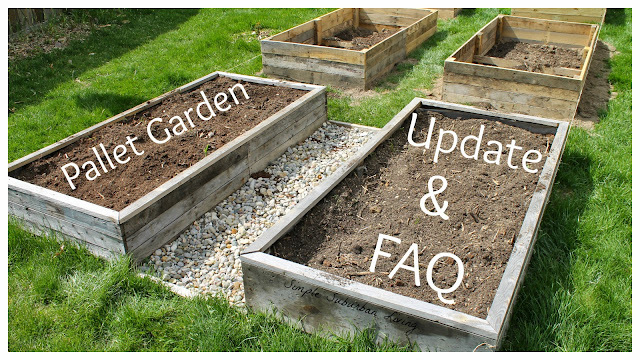 Pallet Garden Update and FAQ - How Did They Hold Up? How did the reclaimed pallet wood garden beds hold up? It has been a year since we have put these free raised beds into action and they have done us well so far. Throughout the last year this project has become fairly popular and there have been some common questions that I thought I would try to answer here. Will the pallet wood hold up to moister over the long term? This is a very valid concern and one that I, quite honestly, shared as well. They have only been through one year so far but as far as I can tell they have held up perfectly. I do not see any signs of rotting where the soil has been in contact with the wood and the outside of the wood has aged nicely. Only time will tell the full story here but I would guess we can get about 5 years out of these before we start noticing any issues. Aren't pallets treated with chemicals that are unsafe for your garden? The wood that we are using from the pallets was all heat treated and this is something you should look for when using it for food production. We also lined the first set of beds with greenhouse plastic since the wood had some oil staining on it we didn't want in the soil. What soil mix are we using? Last year we decided to try the square foot gardening method with these raised beds. With that came using the Mel's mix soil mixture that consists of 1/3 compost 1/3 peat and 1/3 vermiculite. This is a very nice soil mix however it can get pretty expensive to fill beds of this size and vermiculite is hard to source locally. We ended up having to order ours online and it was not cheap! In an effort to keep costs down after we had already ordered the vermiculite we ended up probably not putting in enough compost and good nutrients and added more peat as a filler. Needless to say in the end the growth we had was not stellar. We were happy with our little gardens but this year we want to focus on filling them for less and increasing production. I will have another article soon with our new method of soil fill for the four new pallet beds that I have just built, stay tuned for more on that. We are focusing on locally sourced and bulk materials rather than as much big box store products. Do you put landscape cloth in the bottom of the beds? This question comes up often and then answer to that is yes and no. With the two original beds I put together I did line the bottom with cardboard before I filled it up. However, I do feel that this is largely unnecessary and I don't think it really serves a purpose. Would you use screws rather than nails to construct these next time? I was surprised at how well the nails held up with the original two that I constructed and so I continued to use nails with the rest that I have built. The fact is, I suppose screws would hold better in the long run but that brings up the cost significantly since you need quite a lot of screws for each one. I used drywall nails that I had laying around for the first few and some roofing nails for the rest and they seem to hold up just fine.